The inception of the dust collector has allowed companies to effectively capture airborne particulate from an air stream. This has become more important for several reasons. First, containing particulate — toxic or not — is necessary to provide a healthy and clean work environment. Second, increasing local and global awareness of air pollution, containment and the process dust in industrial applications has emphasized the importance of dust collectors. Finally, expanding regulations have pressured companies to properly design, install, operate and maintain dust collection equipment. To ensure a dust collector is functioning properly, you need to perform periodic inspections, as well as repair and replace damaged or malfunctioning equipment. A routine inspection and maintenance program will boost your equipment’s performance and life. To maintain the health and effectiveness of your dust collector, follow our helpful list of procedures. 1. Create an Inspection/Maintenance Program — A typical program consists of a schedule for periodic inspections that are performed on a daily, weekly, monthly, semi-annual and annual basis. 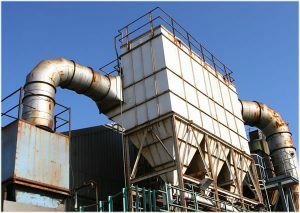 Failing to periodically inspect the dust collector can hurt its performance. Subsequently, the dust collector may not meet EPA outlet emissions standards. 2. Don’t Exceed Recommended Pressure Drop — Sometimes called differential pressure, it’s the amount of static resistance across filters when operating a positive- or negative-pressure dust collector. Pressure drop, typically measured in inches of water column (in w.c.), is a good indicator of the amount of dust that has collected on the filter media and, if continually monitored, the condition of the filters. New filters have the lowest pressure drop because of the inherent permeability of the media. As the bags develop a dust cake, some particulate embeds itself into the filter media, increasing pressure drop accordingly. The filtering of the airstream through this accumulated dust cake provides high-efficiency collection of fine particulate. 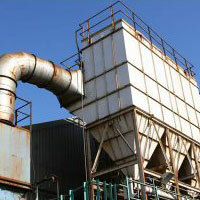 In fact, the highest efficiency a dust collector can offer is just before the cleaning is initiated. However, high differential pressures can cause filter media bleed-through or blinding. Therefore, do not to exceed the manufacturer’s recommended operating pressure drop. 3. Ensure Cleaning System Functions Properly — Equipment use a variety of cleaning systems to dislodge accumulated dust cake from the filter media. Systems include reverse air, shaker or pulse clean. Regardless of the style of cleaning, it is imperative that this system function properly at all times. Without an effective cleaning system, dust will continue to build on the bags. The result will be an increased pressure drop and reduced volume of ventilation air at the pick-up points. Further, airstream velocities within the ductwork will decrease and cause dropout of dust in the ducts. This may choke the entire system and render it ineffective. 4. Watch for Visible Emissions — This includes any particulate that can be seen discharging from the exhaust stack. These emissions indicate a breach in a seal or a broken (torn) filter. In either case, you must find and correct the leak immediately. Not only will the emission cause a health concern and damage the property outside the plant, but it may also bring about monetary fines imposed by local, state and federal environmental agencies. Additionally, fans located downstream of the collector can be damaged from abrasion or become imbalanced if you don’t correct this condition quickly. Continually monitor exhaust from the dust collector. Besides visual inspections, consider incorporating a broken bag detector into the clean air ductwork. If a bag begins to fail, or there’s a leak in the bag seal, you’ll detect the particles that bypass the media. Typically, these detectors use triboelectric technology. These devices can be wired to an alarm horn, siren or PLC. 5. Select the Right Exhaust Fan — Dust collection systems require an exhaust fan to accelerate ventilation air from the point of pick-up, through the ductwork and dust collector filter media and out the exhaust stack. Fans are selected to accommodate volume (SCFM) and pressure drop throughout the system. Calculate the pressure drop by evaluating the static resistance of the dust collector, ductwork and pick-up points/hoods. 6. Inspect the Filter Media — This is the most important item in a dust collector because it accumulates and supports a dust cake. This dust cake is what provides high filtering efficiencies during operation. Inspect the clean-air side of the dust collector for leaks and the bags for tears. If pressure-drop within a dust collector becomes extremely high relative to historical data, it may be caused by excessive dust cake or blinding of the filter bags. Depending on the application, differential pressure may take a number of hours or even days to develop. It is essential that you keep filtering velocities low for new filter media. Reducing the volume decreases the airstream’s velocity, thus protecting the bags from high-velocity impingement of dust. If you expose bags to the fan’s full volume, fine particles may embed themselves into the bags’ inner fibers and begin blinding. This can also reduce the life of the bags by damaging the fibers of the media. So make sure to season a collector’s filter bags. This is not an all-inclusive list. Each piece of equipment and application is different, and each has its own unique components and features. But these simple procedures can help you monitor and maintain your dust collector’s heath, as well as prevent shutdowns due to inefficiencies, prolong filter life and prevent costly EPA fines.